2018 Most Affordable Colleges in Washington, D.C. Located in Washington, D.C., Trinity Washington University is a Roman Catholic university that offers undergraduate and graduate degrees. There are many scholarships available to TWU students such as the Lifestyle Dentistry Scholarship (award of $500), the Gates Millennium Scholarship Program (available for 1,000 students), the Multicultural Advantage Scholarship (available for all races and ethnicities), and many more. Students who wish to pursue the Federal Work Study program must fill out a Student Work-Study Authorization Program and apply for up to three positions. These students will be paid a minimum of $10.50 per hour, and they can work up to 10 hours weekly. Going to college in the District of Columbia is not inherently cheap. Some of this is tied to the strength of D.C.’s academic institutions, several of which are ranked among the nation’s best. But it’s also a matter of geography — everything is more expensive in the capital, education included. Yet you shouldn’t despair. Those same institutions are backed by sturdy endowments and well-funded alumni foundations that help to reduce the net price for all but the wealthiest enrollees. And the District itself provides financial aid in the form of the DC Tuition Assistance Grant and Mayor’s Scholarship to residents with financial need. The city government also administers extensive social services that can lower your living costs if you choose to remain within District borders, instead of commuting to campus from Maryland or Virginia. It’s even possible to get cheap healthcare, lower your monthly utility bills and get assistance with groceries. How? We’ll show you. How to Transfer College Credits in Washington, D.C.
Washington, D.C., does not have significant college credit transfer programs or clear policies for students transferring from community colleges to four-year colleges and universities. This can make it difficult to transfer, as typically, credits are reviewed on a case-by-case basis. However, the University of the District of Columbia offers a community college program with seamless transfer options. Two-year community college students attending a UDC program can complete two years of study at the community college, then transfer into a four-year program leading to a bachelor’s degree. In this program, students with 30 credits or more and an aggregate grade point average of 2.0 or higher (or fewer than 30 credits with a high school grade point average of 2.5 or higher) will be able to transfer. Some associate degrees earned with the University of the District of Columbia community college will qualify for the 2+2+1 Program. This program allows students to transition from an associate degree into a specific bachelor’s degree in science or engineering. The District of Columbia is not a state, but it does have most of the trappings of one, including a government agency for education, known as the DC Office of the State Superintendent of Education (OSSE). OSSE is charged with making college accessible and affordable for residents. Although its website isn’t exactly public friendly, it does a decent job of breaking down the different programs under the Division of Postsecondary and Career Education, including where to take a GED test, how to research colleges and how to apply for scholarships. One thing you’ll need to do in order to qualify for most District funds is submit the Free Application for Federal Student Aid (FAFSA). College Goal DC, facilitated through the YMCA of Metropolitan Washington, can help you with this process. Its volunteers will ensure you get the lowest possible expected family contribution, thereby making college tuition cheaper. Finally, if your projected college start date is more than a year or two away, you can start setting aside money now by setting up a 529 through the DC College Savings Plan. Watch your savings grow as you get closer to your graduation goal. Summary: District high school students only have one place where they can claim resident tuition: University of the District of Columbia. The DCTAG gives them more options by providing up to $2,500 to attend D.C.’s private colleges or HBCUs throughout the country — or $10,000 to offset the difference between the resident and nonresident rates at a public school in another state. Eligibility: You have to be a resident under the age of 25 who doesn’t already have a bachelor’s degree. And you have to be headed to a participating university. How to Apply: Use the DC OneApp and submit financial and academic documents by June 30th. Reapply each year. Summary: STEM majors in metropolitan D.C. rejoice! The Armed Forces Communications and Electronics Association (AFCEA) supports your goal. Eligibility: To win funds from AFCEA, you’ll need to be an area resident heading to a four-year STEM program anywhere in the country. Financial need is considered, but so are academic performance and extracurricular involvement. How to Apply: Send two letters of recommendation, a statement from your school counselor and FAFSA documentation to AFCEA’s D.C. chapter along with your online application by early May. Summary: District of Columbia College Access Program, a nonprofit, hands out renewable $2,000 scholarships to recent D.C. public high school graduates (including charter school grads) with financial need. Eligibility: Just get a 2.0. Once enrolled in college, you’ll need to take 24 credits per year (20 if enrolled at a community college) to reapply. How to Apply: First, send an authorization form. Then, file the FAFSA and apply for DCTAG via the DC OneAPP, which DC-CAP will use to determine your financial need. Last, send copies of transcripts and financial aid forms by May 31st. Summary: Graduates of D.C. public schools who are on their way to a four-year university but have financial need can get some of that covered by the Kappa Scholarship Endowment Fund. Eligibility: You’ll need to own a 2.5 GPA and be able to demonstrate involvement in school or community activities. How to Apply: Submit an application, transcripts and two letters of recommendation by March 31st. The committee uses results from the FAFSA to determine financial need, so you’ll have to send that out ahead of time. Summary: Another award based on financial need, the Mayor’s Scholarship is worth up to $4,000 a year. Eligibility: You must be a resident who earned a diploma from a public high school or charter school (or a GED) within the past 10 years. How to Apply: Again, file the FAFSA and apply for DCTAG first, which the Office of the State Superintendent of Education uses to determine financial need. Then, submit the application by June 30th. Summary: $10,000. Four awardees. One purpose: To give D.C. public high school grads a boost on their way to studying business at a four-year college. Eligibility: A 3.0 and 1400 on the SAT will get your application seen. Honors and extracurriculars, along with a solid essay, may win you the money. How to Apply: Submit your application, two letters of recommendation and transcripts to your DC-CAP advisor. The deadline is in mid to late March. Summary: Aspiring journalists at area universities can win $3,000 from the Sigma Delta Chi Foundation of Washington, D.C. Eligibility: You must be in the second or third year of a baccalaureate program to apply. You don’t have to be a journalism major. How to Apply: Apply by sending your application, a letter of reference and, most importantly, several essays and writing samples to the SDX Foundation. Applications are due in late February. Summary: Are you a valedictorian from a D.C. Public Academic and/or Comprehensive High School? You’re in luck. The Spivack Scholarship wants to add money to your account. Eligibility: Aside from being a District valedictorian? Nothing. Just get accepted to a two- or four-year program. How to Apply: Contact the Community Foundation, which administers the award. Summary: The Ulman Cancer Fund distributes four awards — the Jacqueline Shearer Memorial Scholarship, the Lisa Higgins-Hussman Foundation Scholarship, the Marilyn Yetso Memorial Scholarship and the Perlita Liwanag Memorial Scholarship — to students from the D.C. area who have either battled cancer or helped an immediate family member fight the disease. Each is worth $2,500. Eligibility: Applicants who dealt with cancer somewhere between their 15th and 40th birthdays are eligible. Several of the awards take financial need into account. How to Apply: To apply for all Ulman scholarships, submit one application, along with a physician form, recommendation letter and essay. Applications are due in early to mid-March. Summary: The United Planning Organization gives five $10,000 scholarships to seniors at D.C. public schools each year to attend college. Eligibility: The award is based on financial need, so your family cannot make more than a specified amount in income. How to Apply: Contact the Youth Services Center in Ward 8 for application instructions. Summary: Everyone from dental hygienists to clinical psychologists to licensed physicians can get tens of thousands in school loans paid off by working full time in a designated Health Professional Shortage Area or Medically Underserved Area in the capital. Eligibility: The professional eligibility changes depending on need, so in some cycles, for instance, mental health professionals might not qualify. One thing that is consistent is that you must work at a site that’s certified with the D.C. Department of Health (DOH). How to Apply: The DOH uses two cycles for the program, so you can apply by April 15th or October 30th. You must provide proof of your loan status. Summary: Low-income clients have trouble attaining high-quality attorneys because many lawyers go where the money is. The LRAP tries to make public service law more profitable by doling out $12,000-a-year loans to area attorneys. Better yet, the loans carry no interest and are forgivable, so they’re essentially free money toward existing law school loan debt. Eligibility: Be a District resident and member of the D.C. Bar who makes less than $85,000 in annual salary but who is dutifully paying off a loan. You also have to work for a D.C. nonprofit that provides legal aid to low-income residents. How to Apply: Start by attending one of the mandatory information sessions in October. From there, you can work on the application, which was several components. Summary: Members of the DC National Guard can get $6,000 toward college. Eligibility: You must be in good standing. How to Apply: Details are sketchy, so contact your unit or a veteran’s liaison officer at your school for details. Summary: High school 10th and 11th graders who are itching to attend college can get a head start by becoming an OSSE Scholar. They’ll head to a prestigious East Coast university for free summer courses and may even earn college credit. Eligibility: Be a D.C. public high school student with financial need (or from a family with no college experience). You’ll also need a 3.2 GPA to be considered. How to Apply: Create an online profile before applying. That requires tax forms and transcripts. Students who make it past this stage will be called for interviews. Cheaper College Living in Washington, D.C.
Let’s play a game. Which of the following are more expensive in DC than in the country at large: groceries, housing, utilities or transportation? If you answered “all of the above,” you win. (Unfortunately, it’s not much of a prize.) The only thing that is cheaper in DC is healthcare, and that’s by less than one percent. But there’s good news. The District of Columbia is practically a mini-state, so it has lots of government departments that other cities its size don’t. One department that can work with you to make your college experience more affordable is the Office of the Deputy Mayor for Health and Human Services, which houses both the DC Department of Human Services and the DC Department of Health Care Finance. Under the former, you may be able to cut back on grocery costs via the Supplemental Nutrition Assistance Program (née food stamps), make up back payments to your landlord through the Emergency Rental Assistance program, or get subsidies for your kids’ child care with the Child Care Assistance Program. Under the DHCF, you can apply for Medicaid to get free healthcare, if you meet income requirements. We also mentioned utility costs; for help with those, contact the DC Department of Energy and Environment, which oversees federal programs that keep people’s heat on during the winter, such as the Low Income Home Energy Assistance Program. Real estate in the District of Columbia is expensive, and the space on college campuses is no different. While you’re unlikely to come across free housing programs unless you get hired as a resident assistant, you should keep an eye out for ways to reduce costs. For instance, in recent years, Howard University has run Scholar Connection, a mentorship program that gives participants housing priority (so they can choose a lower-cost or better room) and money toward their meal plan. Similarly, at George Washington, helping other students to move in or out buys you extra free days in your room on campus at either end of the semester. Even without volunteering, it might still be cheaper to stay on campus than to live off of it. That’s because in a residence hall, your utilities, furniture and most transportation expenses are covered. Make sure, though, by plugging in the details on the CalcXML housing cost calculator. The good news? D.C. is not the most expensive spot in the United States. The bad news? It’s the second-most expensive, right after Hawaii. (Yet much less tropical.) It’s especially expensive to buy a house. A mere decade ago, rents varied widely in the District, meaning that lower-priced steals could be found in specific neighborhoods. However, most of the city’s poorer neighborhoods have since been gentrified (controversially), bringing price hikes. Fortunately, most of the area’s colleges help in some way with off-campus housing. 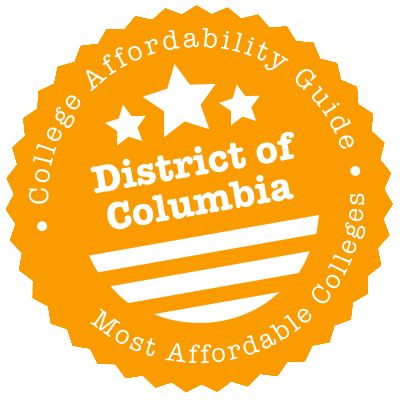 The University of the District of Columbia produces a simple page with advice and links to resources, including housing aggregators and tenant rights info. Georgetown University goes a step further, mandating that all students moving off campus first go through an orientation. The District has an active rental market, so you may have to jump on things quickly before someone else does. If you want to take more time with your search, expand it to the northern Virginia suburbs and southern Maryland, both of which can still put you within walking distance of a DC Metro station. Find affordable housing at DC Housing Search or broaden your results by taking the dollar limits off at a site like MyApartmentMap.com. Some schools, such as Howard, have their own off-campus housing search service to help students find an apartment and roommates. If you’re in desperate need for something right away, go to the District government website. There, the DC Department of Human Services publishes a list of shelters divided by type (e.g., short-term, family, etc.). The DC Department of Energy and Environment funds three programs for residents who find their utility payments to be onerous. The Low Income Home Energy Assistance Program makes partial payments directly to the utility company on your behalf if you meet the income qualifications. Those same income guidelines are used to determine whether you qualify for the Utility Discount Program, which reduces your combined electric, gas and water bills by up to $1,150 annually. Last, the Weatherization Assistance Program tries to reduce your utility bills long-term by fixing parts of your home that are causing increased energy usage. George Washington, Georgetown and Howard all have highly regarded university hospitals, meaning students in D.C.’s northwest quadrant have extensive access to some of the best medical care in the country. Most campus-bound colds and preventive care, however, are best left to smaller clinics, and nearly every campus these days maintains one. In fact, you may notice a health fee on your bill if you’re at a school like Trinity Washington University. It charges $250 a year, which translates to unlimited access to the campus clinic for acute care, physicals, gynecological examinations and other routine care — not to mention counseling, which is a standard free service on the vast majority of colleges campuses. Campus clinics don’t cover everything, and they’re not always included in your school fees, so you may feel compelled to look elsewhere in the District for primary care. The DC Department of Health maintains a useful list of local clinics that explains who uses sliding fee payment scales, the types of insurance they accept and the patient populations they work with. Or use this interactive map, which features the same information. For mental health services, cross-check this list with the Department of Behavioral Health’s list of community-based service providers. You’re in luck if you need cheaper dental care. Howard University College of Dentistry is a teaching school that takes patients from the community. They don’t accept patients that aren’t valuable for teaching purposes, so you should have backups in mind. FreeDental.org can point you in the direction of a handful of free and low-cost spots to get your teeth worked on. One of the biggest costs of going back to school for some students is child care. And although it’s readily available throughout the District — you can find a facility at LearnDC — it’s often most convenient to have your little ones on campus with you. Of course, not every college has child care, but many do. Georgetown’s Hoya Kids Learning Center is reserved exclusively for toddler to preschool-age children of students and staff. The center runs a scholarship program and waives application fees for income-qualifying applicants. However, before you stop your child care search, you should know there are fewer than 60 spaces available; expect to be on the waiting list for a few years. Elsewhere, the UDC Lab School is a Head Start facility, so you’ll have to meet income requirements to qualify. Once you do, however, your child care tuition is free. If you’re going to a different college and want to lower your costs, apply for a subsidy through the DC Department of Human Services. If you live in DC, you already know that the Metro is a good way to get around town. With six lines extending from the center of town out into each quadrant and beyond into Maryland and Virginia, the Metro also has stations near most area universities, with the notable exception of Georgetown. WMATA buses are meant to cover the gaps between stations, but those still cost money to board. By looking on your college website, you can see what free or discounted transportation services your school offers. Howard University and Georgetown University both operate buses around their immediate areas, while George Washington runs shuttles between its Foggy Bottom, Mount Vernon and NoVa campuses. In 2016, American University piloted WMATA university passes, and if you attend AU, you may notice $260 added to your student fees. That gets you on D.C. trains and buses for free for the year. The food insecurity rate in D.C. is below the national average, but more than 1 out of 10 residents still skip meals, and not by choice. To combat food insecurity on its campuses, both Trinity Washington and GW run food pantries. The Trinity Food Pantry is run by appointment and meant to get students over the hump during a short-term emergency. The Store at GW keeps regular operating hours. After filling out a store access request form, students are given a time when they can visit the pantry. Of course, there are plenty of food resources off college campuses as well. Search for pantries and other assistance at the Capital Area Food Bank’s website. And if you have a young baby or a little one on the way, see if you qualify for additional food support from D.C.’s WIC program. Our nation’s capital is divided into four quadrants — Northwest, Northeast, Southeast and Southwest. Northwest is the biggest quadrant and home to most of the District’s universities: George Washington, Georgetown, Howard and American. Northeast, meanwhile, has room for both Catholic University of America and Trinity Washington University, not to mention Gallaudet University, the nation’s premier college for the deaf. UDC places its bachelor’s and master’s level programs in Northwest and its community college programs in Northeast. Historically, Northwest is the most expensive of the areas, along with anything within a 15-minute walk of the Capitol building. But all together, D.C. takes up a compact 68 square miles along the Potomac River, and much of that is accessible via the DC Metro system, which extends out into Maryland and Virginia. In other words, don’t feel restricted to living right next to campus. Two caveats: First, it’s important to balance what you can save on rent by living further out with the added cost of transportation. Second, DC Metro has been hit with reliability & maintenance issues in the past; you may need to consider WMATA bus options as a back-up. Where to Go for Help in Washington, D.C.
Academy of Hope isn’t for you if you’ve already got a high school degree. But if you’re looking for a GED so you can move on to college, 60 percent of graduates from this public charter school for adults continue their studies in a college or vocational training setting. Capital Area Asset Builders runs free money management courses covering budgets, debt and savings. Speaking of savings, low-income residents may qualify for its Matched Savings Program, which kicks in money for every dollar set aside. College Success Foundation – District of Columbia supports disadvantaged students as young as 12 in getting into college with the Higher Education Readiness Opportunity (HERO) Initiative, which provides mentoring to students, preps them for standardized tests and brings them to area universities for campus visits. It also runs three college scholarship programs you’ll want to apply for. Community Tax Aid, Inc. can help you get ready for submitting the FAFSA by first getting your (or your family’s) taxes in order. For free. Go to one of its 20 sites in the metropolitan area for assistance or do it yourself online. District of Columbia College Access Program does a bit more than administer scholarships (see the scholarship section). It runs a College Tour Series that brings high school students to East Coast colleges as far away as North Carolina and Pennsylvania. United Planning Organization has a full suite of programs designed to benefit low-income residents, including rental counseling, financial literacy training and Early Head Start. YMCA of Metropolitan Washington has child care on lockdown with before-school, after-school and preschool programs throughout D.C., Virginia and Maryland. Remember: D.C. is the capital of the United States and a major city, which means the resources mentioned here are just a small sample of the whole. To find exactly what you’re looking for, search 211 Answers, Please!